1. Harry Potter and the Sorcerer's Stone: The Illustrated Edition by J.K. Rowling - I pre-ordered this special edition almost as soon as I heard about it, and I cannot wait to re-read this book for the first time. Gimme gimme! 3. Six of Crows by Leigh Bardugo - I enjoyed Bardugo's Grisha Trilogy, and I've heard such great things about this book already. I pre-ordered a copy, and I'm hoping to start it as soon as I get my hands on it! 4. Monstrous Beauty by Elizabeth Fama - I've had my eye on this book, but I think now is the time to read it. There's something about mermaids - dark and dangerous ones at that - that just feels perfectly suited to fall. 5. The Cavendish Home for Boys and Girls by Claire Legrand - I'm pretty sure that I had this on my Fall TBR last year, but I never read it so I'm putting it on my list again because it just screams fall read to me. 6. Alanna: The First Adventure by Tamora Pierce - I bought the box set of this series and mentioned it in a recent TTT post, and the reaction convinced me that I need to read this one sooner rather than later! 7. Velvet Undercover by Teri Brown - World War I + famed women's spy group = sign me up right now! I haven't read anything by Brown before, but I requested this book the second I read the summary on Edelweiss. 8. Da Vinci's Tiger by L.M. Elliott - I refuse to use the new cover of this because I hate it! But what can you do?! I love historical fiction, and this is a time period I don't know much about so I'm excited to dive in. 9. Every Word by Ellie Marney - I read Every Breath last year and thoroughly enjoyed it (though I never got around to reviewing it). I was thrilled when I was approved to read this for review, but I still haven't read it yet! 10. First & Then by Emma Mills - Alexa sent me this book because she said she thought of me the entire time she was reading it. She sent me some screenshots of the Austen references, and I can't wait to read it for myself. Woah, hang on! There's an illustrated Harry Potter? How on Earth did I not know?! Anyways, great list! Just discovered your blog - I'm also Hannah, and from South Africa to boot! (Read your 'about' page!) It's a weird world. 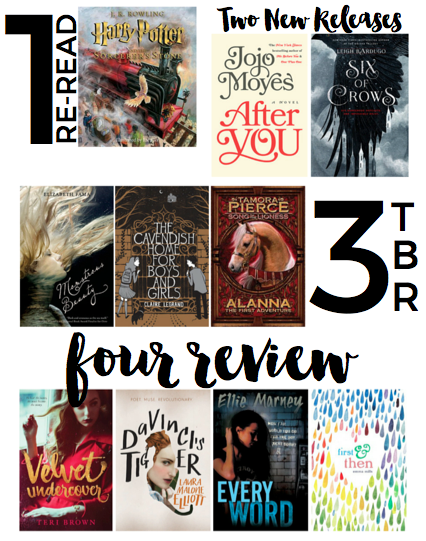 Great selection here - I'm eagerly anticipating Six of Crows, and the Alanna series is a fabulous must-read! I cannot wait to read After You! Me Before You It was one of those books where I missed the characters when it ended. I'm a little scared to see what is next, but also very excited. I really have to read some JoJo Moyes, and I have three out of four of your review books on my review list for this fall (First & Then, Da Vinci's Tiger, and Velvet Undercover). I'm glad you included the HP book - I need to go pre-order it, it looks so gorgeous! Have you read any Tamora Pierce yet? I love her books so much. I first read the Circle of Magic series in grade school and now have all of her books. I might be just a tad obsessed. I'm a little nervous about After You too, but I definitely need to read it. I loved Me Before You! ALANNA!!! Hannah, you have no idea how happy my heart is to see that title on your list. I'm sincerely hoping you love Tamora Pierce and her novels as much as I do <3 Also, I totally think you'll enjoy reading First & Then! It's a really fun, easy read. And SIX OF CROWS was fantastic!! I, too, feel a little uncertain about After You, and I think I'm going to read a few reviews (like yours, because I trust your thoughts!) before I decide to pick if I'm going to pick it up =) I loved Me Before You SO SO SO much that I can't risk ruining it if the sequel is disappointing.